Youth conflict resolution is about teaching young people new ways to resolve disputes without resorting to violence, verbal or physical. Too many young people today are caught up in situations of teen conflict that they cannot manage – jealousy, teasing and bullying and outright aggression. Conflict resolution education is an important component in a violence prevention and intervention program in schools and youth communities. The most successful programs seem to be those that offer a comprehensive approach to problem solving, teaching effective listening and communication skills, and critical and creative thinking with an emphasis on personal responsibility and self discipline. Parents and teachers need to work together to mutually reinforce the programs put in place to empower young people with the skills and processes of conflict resolution where teen conflict exists. Adults of course are the final authority, especially if the law is involved, and adults therefore need to model the peaceful resolution of conflicts in all area of their lives, including personal relationships. Context is important, and even in inner city schools where drug use and delinquency is a major problem, violence reduction programs have been successful when youth conflict resolution has been part of the curriculum. Most programs follow a series of steps that include setting ground rules and agreeing to work together with no name-calling, blaming, yelling or interrupting. Good listening skills are stressed as the way to understanding the other person’s needs and point of view. Common interests are established and solutions are brainstormed where everyone gains something if possible. Negotiation to reach an acceptable compromise leads to an agreement which should be written down and checked on at intervals to make sure it still stands. These basic steps can be established at home to resolve normal conflicts about homework and bedtime or at school to deal with aggression and violence. Schools and communities can offer youth conflict resolution training courses and peer mediation programs which prove highly successful in teaching teens to serve as mediators and resolve conflicts among their peers. Many schools have adopted programs that incorporate conflict resolution into classroom teaching and throughout the school environment and communities also are providing mediation services and training for youth and adults. Success stories abound; led to the reduction of fights in an Albuquerque elementary school playground from “100 to 150 fights every month….to maybe 10.” A North Carolina middle school instituted conflict resolution education and after one school year, in-school suspensions decreased by 42% and out of school suspensions decreased from 40 incidents to 1. 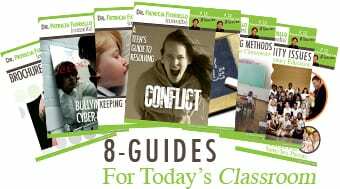 Many programs are now available to show teachers how to integrate conflict resolution into the curriculum, classroom management and discipline practices. With an emphasis on cooperation, appreciation of diversity and effective communication, students learn how to use principled negotiation to achieve goals and resolve disputes. Effective youth conflict resolution programs noticeably improve the general school culture by reducing the number of disruptive and violent incidents, decreasing the number of school absences provoked by fear of violence, reducing the number of suspensions and disciplinary actions, increasing the effective time for academic instruction during the day and building the confidence and self respect of the young people engaged in the programs. READ How Much Would You Pay for Lesson Plans? A useful guide for teenagers is Dr. Patricia Fioriello’s eguide, A Teen’s Guide to Resolving Conflict, which prepares teens with strategies and the sort of responses they can use to help resolve conflict in a positive manner. Once teens embrace the concepts and develop the social and interpersonal skills of negotiation, compromise and self discipline they can generate effective solutions, learn to integrate feelings and actions and become empowered individuals with a powerful influence for good among their friends and community.